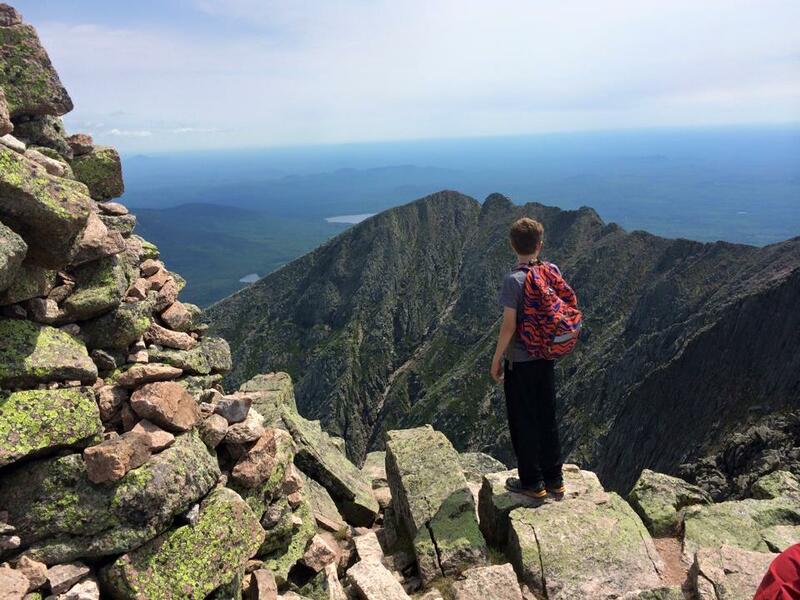 Last year when my older son went to summer camp at the Maine School of Science and Mathematics we stopped at Baxter State Park and hiked Baxter Peak as a family. 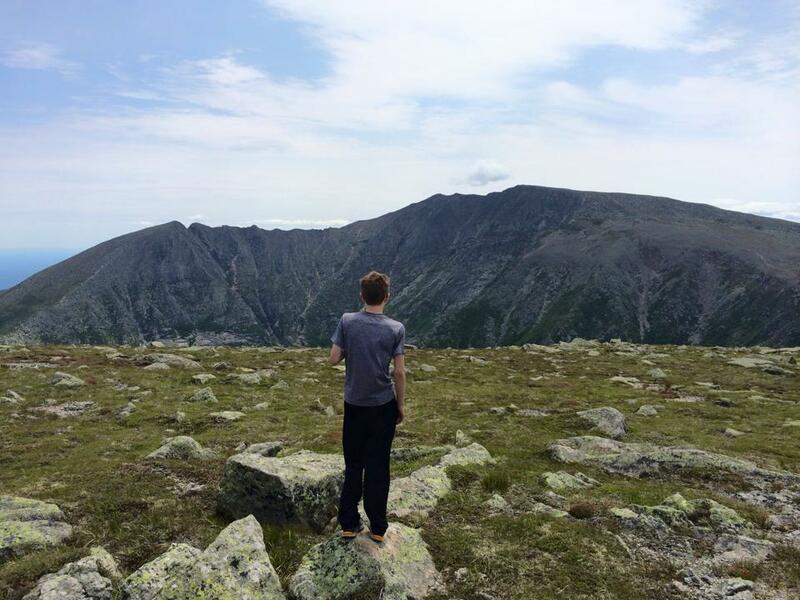 When he went this year just the two of us took the trip, but we stopped and hiked Mount Katahdin again. We stayed just outside the south entrance of the park at the Penobscot Outdoor Center Campground . I was previously unaware of this campground but it still had sites available even though it was 4th of July weekend. It was the base camp for whitewater rafting trips and other adventures in the area but we got a campsite deep in the woods away from the crowds. The following morning, on the 4th of July, my son and I got up with sunrise in order to get into the park at a reasonable time. I had already picked up a parking pass for the park, so we were guaranteed to get in as long as we showed up by 7:00 am. We got to the park entrance at 6:30 am and got the last parking spot in the Roaring Brook parking lot. We signed in at the ranger station and then started up the Helon Taylor Trail. It was hot and humid and we were looking forward to getting above treeline. The Helon Taylor Trail climbed Keep Ridge fairly aggressively with lots of boulders to pick our way over and around. When we broke through the treeline we were greeted by a massive cloud of biting black flies. Those little buggers bit hard enough to draw blood and would congregate on any exposed skin if we stopped moving for a moment. Luckily, as we moved above the trees the black flies found the sun and heat inhospitable and the insect population became more bearable. We made our way up Keep Ridge, passing group after group of people. It was by far the most crowded I had ever seen in Baxter State Park. But, the views still outweighed the inconveniences. At the top of Keep Ridge we climbed the talus-strewn cone of Pamola and made it to the summit at 9:40am. There were groups of people gathered about the mountain top, so we found a quiet spot looking over the edge to the basin below. We ate a quick snack and then started the climb down into the notch below Chimney Peak and the start of Knife Edge. It took quite a while to get over Chimney Peak as there was a queue people waiting to take their turn climbing down into the notch and then up the face of Chimney Peak. I might have normally been frustrated by the number of people and having to wait, but the notch and the sketchy climb up Chimney Peak was my favorite part of the entire hike. Once we did climb out we were still stuck behind folks for a while on Knife Edge. Eventually we were able to pass the groups and get our own space on the trail. 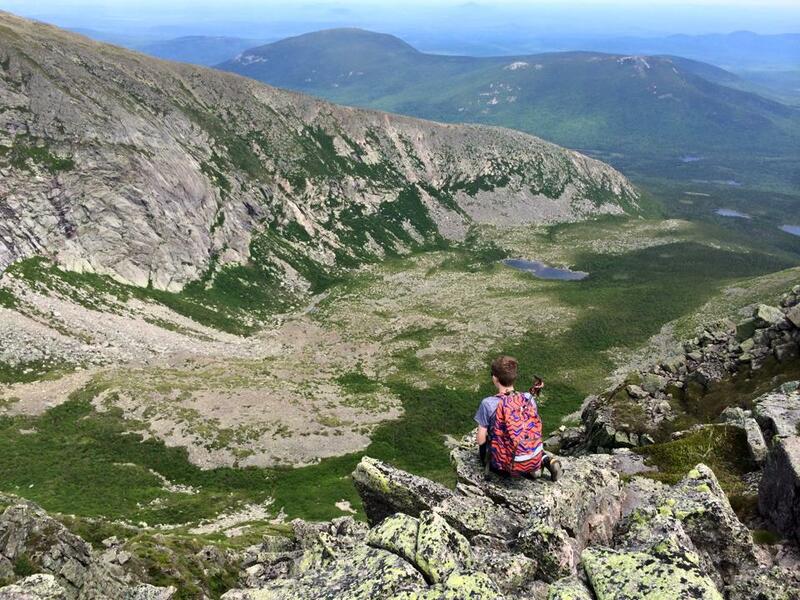 We thoroughly enjoyed the hike along Knife Edge and stopped frequently to take in the views toward the Allagash Wilderness on one side and the drop toward Chimney Pond on the other. Parts of Knife Edge were very narrow and should not be attempted by people afraid of heights or unsure of their footing on uneven terrain. My son had no problem navigating the challenging trail and lead us at a decent pace when we weren’t gawking at the scenery. 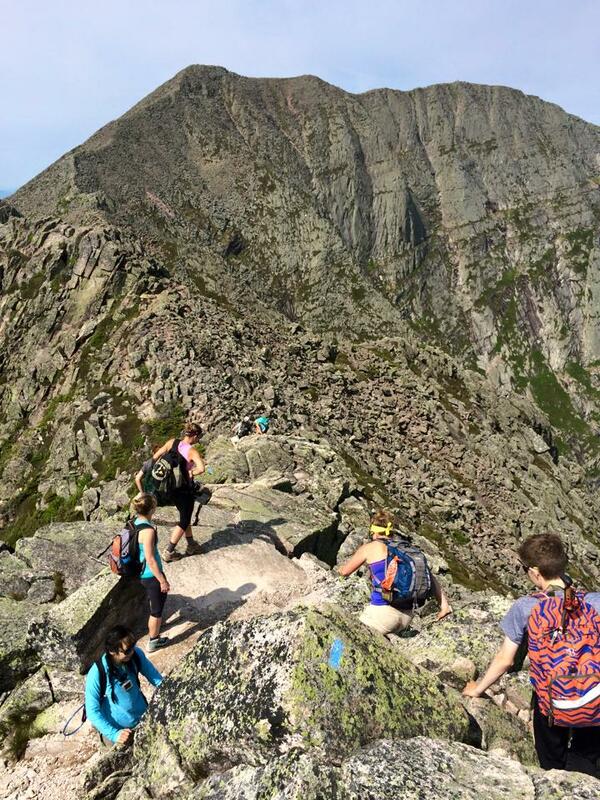 We got to Baxter Peak at around 11:00 am and much like Pamola Peak and Knife Edge it was very crowded. We climbed down a little bit toward Chimney Pond to get away from the crowds and out of the wind and had an early lunch. We dangled our feet over a massive drop-off and relished our quiet reign over the mountains below. At one point during lunch I watched two adults hiking along Knife Edge and approaching Baxter Peak. I took them for father and son and the younger adult seemed a bit out of shape and exhausted. Right as they were making the summit the young adult stumbled and started a head-first plunge over the edge of the trail. The older gentleman grabbed his pack and stopped his forward progress. He most likely saved the other’s life. They exchanged knowing glances and continued toward the peak. By the time we finished our lunches we were being pestered by flies and other hikers seeking solace from the crowds above. 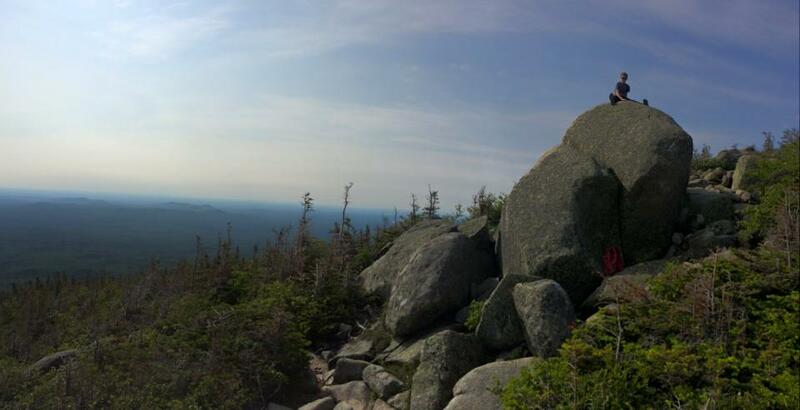 We packed up and started out trek down Baxter Peak via the Saddle Trail. Going down Saddle Trail was fairly mild (at least prior to it dropping into the basin) though there was an area comprised of softball-sized rocks where the footing was unstable. 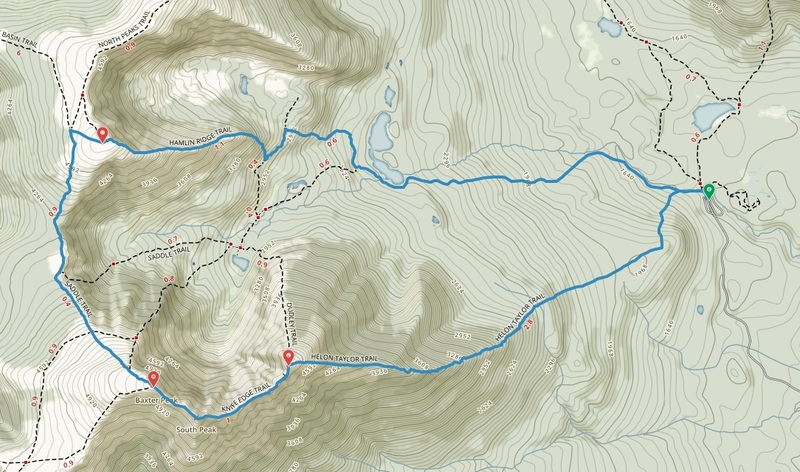 When we got to the intersection with Northwest Basin Trail, we took it toward Hamlin Peak instead of following the Saddle Trail down to Chimney Pond. I was fairly tired at that point and asked my son if he was sure he wanted to do another peak. I assumed he would be getting tired as well but he seemed enthusiastic about doing Hamlin. The trail up Hamlin was pretty mild, it matched the slope going up Baxter Peak from the saddle but shorter in distance and elevation. Once we got off the popular trails we passed one person and saw two more from a distance. Otherwise we had Hamlin to ourselves. We got to Hamlin Peak at 12:30 pm and my son raced ahead to beat me to the summit. It was his first New England 4000 Footer to bag before me. The view from Hamlin was great. It provided an excellent profile view of Pamola Peak and Knife Edge. After a couple of Clif Bars we started down the Hamlin Ridge Trail. It had amazing views into North Basin and many scrambles over boulders and outcroppings. 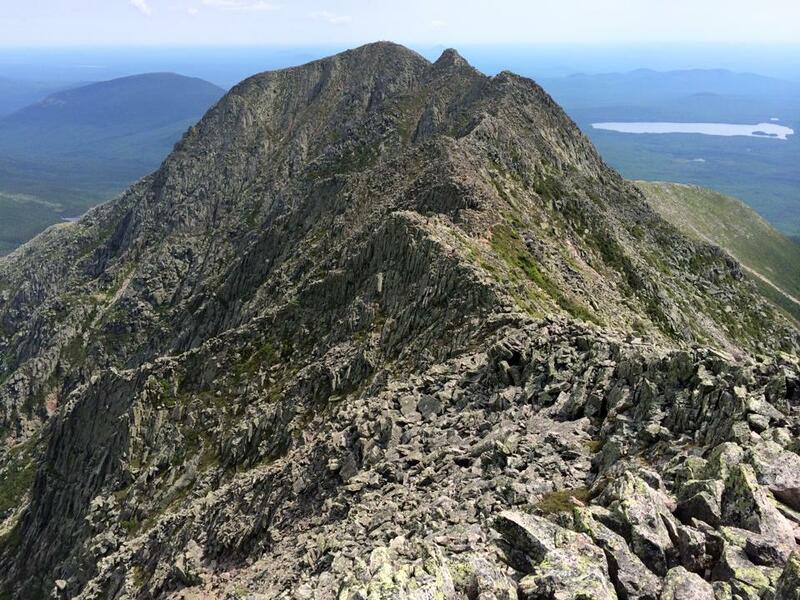 The first time I had hiked in Baxter State Park the ranger I spoke with suggested climbing Hamlin Ridge Trail as it provided some of the best views and was less crowded than the rest of the trails on Katahdin. Having now hiked it, I would definitely echo his suggestion. Once we hit the treeline again we were attacked by more biting black flies. The rest of the hike out was just navigating around the basin trails followed by the flat slog down Chimney Pond Trail. We got to our car shortly before 4:00 pm and made the short drive back to the Penobscot Outdoors Center Campground. 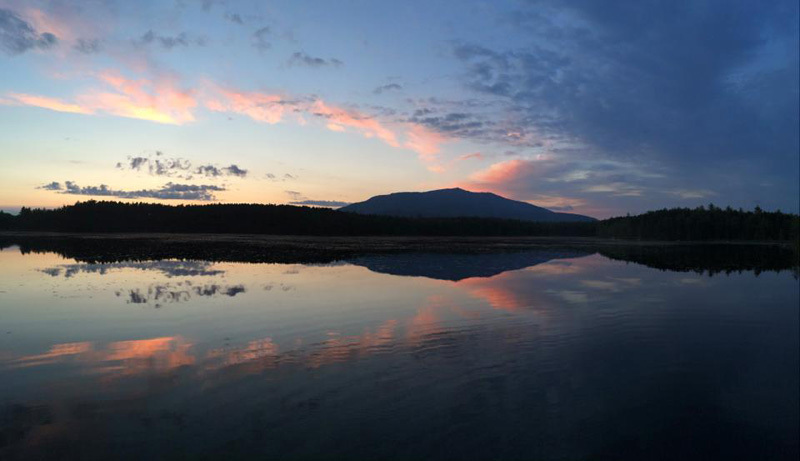 Before heading back to our campsite we went to the Outdoor Center and rented a canoe and paddled around Pockwockamus Pond, in the shadow of Mount Katahdin. It was definitely a great perk to staying at the Outdoor Center as there was no additional charge for the rental. After canoeing we settled back at our campsite and made dinner. We had gotten directions to the 4th of July fireworks launching in East Millinocket but I was too worn out to drive into town and back that evening. Instead we watched sunset from Pockwockamus Pond and whittled by the campfire until we were too exhausted to keep our eyes open. 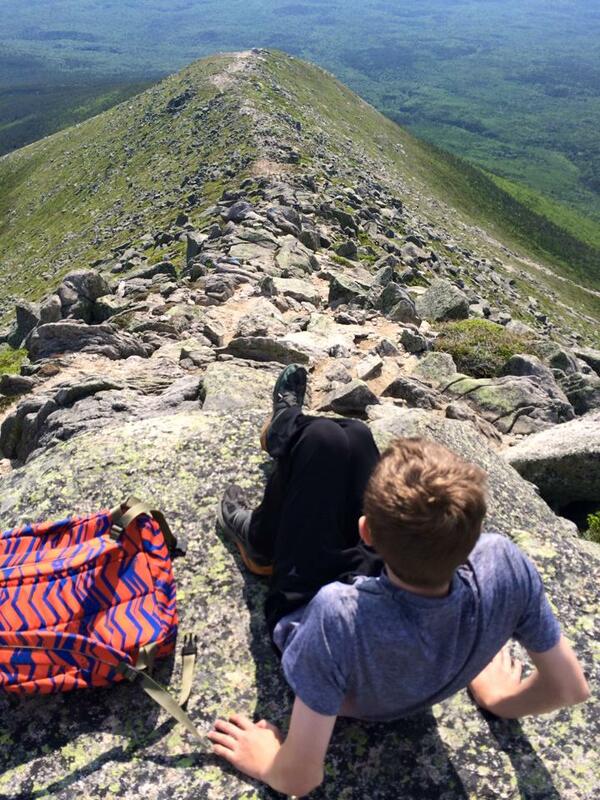 I was incredibly impressed with my son as we hiked over 11 miles and 4000 feet elevation gain as he never once seemed tired; only enthusiastic to continue on. We he returns to MSSM Summer Camp next year we plan to stop at Baxter State Park again so that we can do North Brother. I’m glad we’ve made Baxter State Park a yearly tradition and look forward to hiking it for many years to come. “Day Use Parking Reservation System.” baxterstateparkauthority.com. Baxter State Park Authority. 13 November 2015. “Penobscot Outdoor Center.” neoc.com. New England Outdoor Center. Web. 13 November 2015. “Summer Camp.” mssm.org. The Maine School of Science and Mathematics. Web. 19 November 2015. This entry was posted in Hike and tagged 4000 Footer, 4th of July, Baxter Peak, Baxter State Park, Hamlin Peak, Katahdin, Maine. Bookmark the permalink.